Annual Holiday Bake Sale and This and That Sale. Visitors are always welcome to attend any of our events. for your upcoming Christmas Celebration. 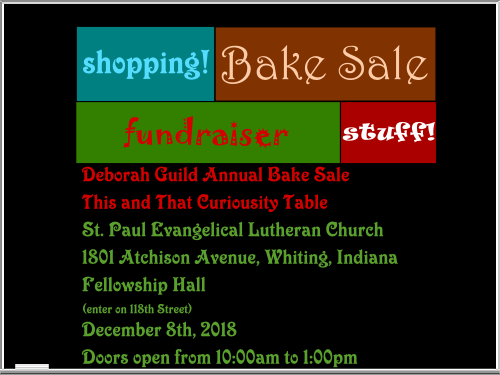 The Deborah Guild is sponsoring the Annual Holiday Bake Sale and This and That Sale. Many Homemade baked goods will be for sale. Also there will be a plethora of Items for sale and a beautiful Holiday Quilt will be available, through Silent Action, made by the St. Paul Quilters. And Hot Cocoa will be served up, for your refreshment, by the St. Paul Sunday School Children, to defray the costs of the completely new Christmas Pageant being held on December 24th at our Evening Service. This Fundraiser is to support on-going Church Projects. All Congregation Members are encourged to donate baked goods to the Bake Sale. This and That Item donations of Winter Gloves, Hats and Scarves, Décor, Holiday Items, Jewelry, Accessories, Housewares, Books, and any other odds and ends, are greatly appreciated. Thanking you in advance for your support for this church fundraiser. If you have any questions, please call Marge Maicher at 219-659-4548.